Rishikesh, nestled in the laps of the lower Himalayas, allures many a traveler with its sacred nature. The city is bestowed with various temples, yoga centers, the holy river Ganga and oodles of adventure sports. There are many sorts of hotels in Rishikesh you can go for according to your budget and need. The budget hotels in Rishikesh provide facilities like room service, internet access, concierge service and a perfect setting that will take your heart away. On the other hand, the luxury hotels render a lovely sight of the Himalayas besides a plethora of facilities like parking, round the clock room service, travel information and many more. The superb amenities, scenic beauty and many other surprises available here, is certain to provide you the best time of your life. Positioned in the heart of Rishikesh with superb sight of the River Ganga, Great Ganga Hotel is one of the recommended hotels in Rishikesh. It tenders an amazing retreat in the lap of the Himalayas. Famed for its endearing hospitality, perfect setting and impeccable service, it enables the visitors to relish their pleasure time with meditation and yoga. The hotel has 45 rooms that are elegantly designed and come with a host of facilities. The staff at Great Ganga Hotel ensures that your needs are met. Overall, it is a fantastic place to stay, tendering both comfort and opulence. Overlooking the famous Rajaji National Park, Ganga Kinare Hotel is among the famous hotels in Rishikesh. It is easily reachable from the must-see attractions of the city such as Parmarth Niketan, Ram Jhula, Triveni Ghat and Bharat Mandir. It is the perfect place to relax and infuse in the serene ambience. The hotel also features a spa center and a coffee shop. The facilities offered at the hotel are banquet, room service, Multi- cuisine restaurant and yoga. Offering you an array of facilities and services, Hotel The Amaris is perched on Dehradun Road in the beautiful city of Rishikesh. The hotel comprises 50 rooms and suites which are provided with contemporary amenities like tea/coffee maker, television, mini bar, telephone and attached washroom. With a banquet hall and a meeting room, it caters to the needs of every traveler. Besides this, the hotel features a souvenir shop, bakery and full service spa. Wildlife lovers can also pay a visit to Rajaji National Park which is one of the famous tourist spots. Visitors at Hotel The Amaris are served with different kinds of cuisines. There is a rooftop restaurant called Amber offering refreshing drinks along with charming sights of the surroundings. One of the best resorts in Rishikesh, Divine Resort tenders you spectacular sight of sunset and a captivating sound of river of sacred Ganga. One can also relish taking yoga and meditation classes in the heavenly setting of the resort. The hotel tenders scores of facilities to enhance your stay in Rishikesh. The guestrooms at Divine resort come with plush amenities like satellite/cable TV, balcony, daily newspaper, mini bar, internet access and attached bathroom. 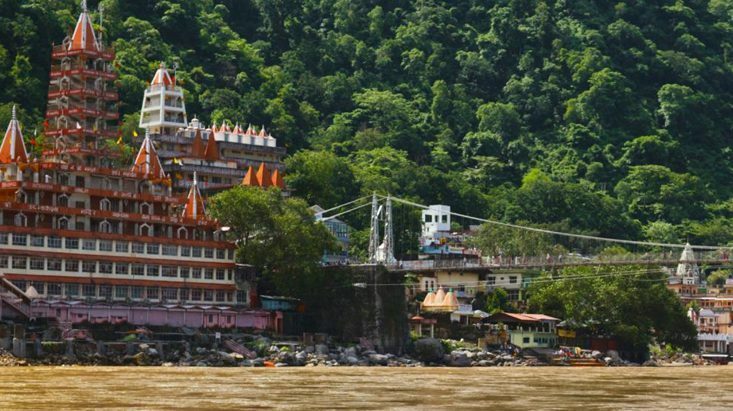 It is certainly an ideal choice for tourists to Rishikesh. Those who love venturing out can visit the attractions like Lakshman Jhula Bridge, Maharishi Mahesh Yogi Ashram and Swarg Ashram. A perfect mixture of comfort and luxury, Vasundhra Palace offers easy access to many famous attractions in Rishikesh. The excellent service, lip-smacking cuisine and warm hospitality make for a remarkable stay. Visitors can take pleasure in exploring the city’s famous attractions like Swarg Ashram, Ram Jhula and Lakshman Jhula Bridge. Round the clock room service, conference hall, safety deposit box and elevator are some of the facilities offered at this palace. The pleasant ambience of this hotel is reflected in each and every room. Guests can also indulge in various recreational facilities within the premises of the hotel. Enveloped by breathtaking mountains, Tapovan Resort is an idyllic place to unwind and invigorate. The resort has well designed rooms, featuring classy interiors and contemporary amenities. Visitors can choose accommodation from three options such as deluxe, executive and suite rooms. It promises tourists a comfortable stay coupled with holy charm. The hotel also renders tour assistance, money exchange, dry cleaning services and car rental. Visitors can also relish fresh food and scrumptious cuisine at the restaurant of the resort. Positioned amongst the foothills of the Himalayas, Narayana Palace is a serene property in Rishikesh. It tenders visitors superb opportunity to soak in the tranquility and peace of the mountains. The air-conditioned rooms at Narayana Palace are classed as cottage, deluxe and suite. The hotel has an excellent multi- cuisine restaurant that serves an array of delicious food. Some of the facilities offered to the visitors during their stay are conference hall, laundry service, meditation, parking, intercom and many more. An excellent resort that renders luxury accommodation clubbed with charming natural beauty of Rishikesh, Ganga Beach Resort tenders a wonderful view of the surroundings making it the best place to spend some time with friends or family. The resort provides various facilities such as gymnasium, spa, conference hall, multi cuisine restaurant, swimming pool, beauty salon and thrilling adventure activities. One can also plunge into exciting adventure sports activities like river rafting, mountaineering and many more during the stay at Ganga Beach Resort. Erected in 2012 in a perfect setting, Atali Ganga tenders easy access to the must-see attractions of the city. The state-of-the-art facilities and warm hospitality make for a remarkable stay. The hotel renders recreational facilities like outdoor pool, spa, library, private beach and water sports. Overlooking the River Ganges and woods, it features 22 well designed rooms that are equipped with contemporary facilities. Visitors can also relish the spectacular view of the River Ganges from their rooms. Besides this, the guests can enjoy lip-smacking cuisine at the stylish restaurant- “White Water Cafe”. From breathtaking sights, flowering trees, authentic service to excellent dining, Raga on the Ganges is situated on the bank of holy Ganges and is the best place to stay for those who love staying close to Mother Nature. It renders assistance to visitors in making arrangements for paying a visit to the most famous attractions located in and around Rishikesh. The hotel has 31 well furnished rooms that are categorized as standard, deluxe and cottage. Guests can step into the on-site restaurant serving Indian, Chinese and continental cuisine to gratify their hunger. It provides for a perfect stay of visitors through its plethora of services. These above mentioned hotels tender countless options for your pleasure. So, pick the one that matches your pocket. Book it in advance to avoid any last minute rush.